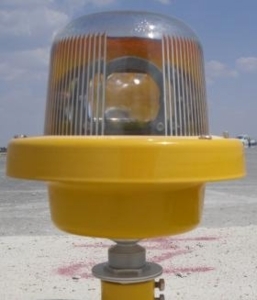 ZA163 - Runway Edge Light - ATG Airports - Description - High intensity, bi-directional (with omni-directional component), elevated runway edge light for use in all weather operation installations up to ICAO category III systems. ZA163 can also be used a medium intensity, bi/uni-directional elevated threshold/end light. Suitable for use in 6.6A airfield lighting circuits, normally supplied from either a 45W, 100W, 150W or 200W series circuit isolating transformer. Power consumption varies depending upon type of lamp fitted.